The Republican Party is infamous for consistently changing its standards based on who is in the White House, and for constantly moving the goalposts for GOP support of any policy, regardless of what they requested earlier. This has been on display for the last two years, as the GOP says they will support a bill if "X" happens, then "X" happens, and they decide they need something else to happen before they will support what they previously promised to support. 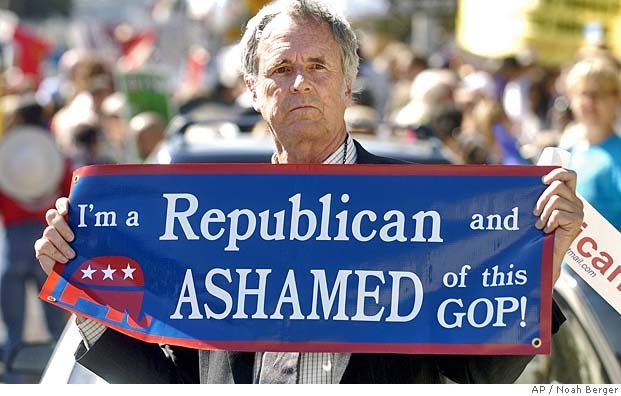 Name an issue, and the dishonest members of the Republican Congressional Caucuses have violated their word on it. But the so-called moderate Republican Senator from Maine, Susan Collins, has taken it to a new level with the START nuclear treaty with Russia. Last year, the Republicans signaled they they would support ratification of the treaty, but wanted to wait until after the midterm elections so it wouldn't become "political." Now, after the election, the Republicans have, once again, reneged on their commitment and are acting like petulant little children. They want "more time" to debate a treaty that they have had for over a year, and one that they refused to debate prior to the election. Sen. Collins has decided that for her to support this vital treaty with Russia, she needs to know that former President Bush supports it first. She told the Washington Post, "It would be wonderful if President [George H.W.] Bush would come out for the treaty. That would be so powerful and definitely help." NEWS FLASH: He's not the president anymore!! He hasn't been since January 1993.We have a president, you twit, and he supports the treaty. Did Reagan have to get Gerald Ford or Jimmy Carters endorsement for treaties to get ratified by a Democratic Congress. Of course not. Has any president been held to this idiotic new standard?! Never mind the fact that former Bush-41 National Security Adviser Brent Scowcroft; former Secretary of State Henry Kissinger; former Secretary of State James Baker; former Secretary of State George Schultz; Reagan Chief of Staff Kenneth Duberstein; Reagan Chief of Staff Howard Baker; and former Secretary of State Colin Powell all support ratification. Now we need to hear from a Bush directly. When will this madness end? Playing politics is fine for an election, but when it jeopardizes national security, it is not fine. This embarrassing spectacle that the Republican Party is putting on of opposing things they used to support and supporting things they used to oppose (depending on where Pres. Obama happens to be) is childish and dangerous. Try acting a little more like a responsible member of the US Government and less like a pundit on Fox News, people. Collins is scared of being voted out next time methinks. Speaking of moderate Republicans, Justice Stevens is a moderate R (which I didn't know) and his interview on 60 minutes was golden as he blasted SCOTUS for giving the election to Bush in 2000 and for the Citizens United decision. I admire Ellsberg for what he did more than 40 years ago, but I think he is a little off on this one. Some of the leaks show that, frankly, too much stuff is classified. But I still see Assange's chief motivation to be embarrassing the US. Ellsberg wanted to stop a war based on a lie. Assange is a hacker by trade, and hackers just want chaos. That is their own agenda. I don't want chaos. Julian Assange is a tool, and I don't mean that in a nice way. Thanks for your pov on this topic Dave. I can see both sides of this debate and could easily change sides, dependent on information that was/will be leaked. 133,887 marked unclassified, 101,748 marked confidential and 15,652 marked secret, according to the site. For me, that is the most important info gleaned from these cables...the truth about Afghanistan's leaders and that the US knows it and still props them up.